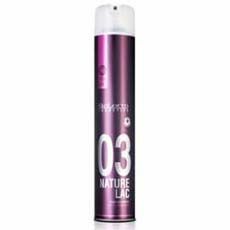 Nature Lac Pro · Line is a strong fixing hairspray especially suitable for people with sensitive scalp. A strong, glossy finish without residue. Nature Lac has passed all clinical tests until reaching the category of hypoallergenic. Smoother, natural, non-frizzy hair with Nature Lac's quick-drying hairspray.